Views on the Japanese problem in the Hawaiian Islands, differing very greatly from those held by many people on the mainland of the United States, and particularly in California, were expressed by Mr. S. Gray, Town Clerk to the Mount Eden Borough Council, who returned by the Niagara yesterday after a health trip to Honolulu. Mr. Gray compared the advance made in the Hawaiian Islands with that of the British colony of Fiji, and while giving the Americans credit for the commercial progress evident in the northern group said that it was due to the taste introduced with the Spanish mission type of architecture and the introduction of outside capital, much of which was British, that Honolulu in particular had been made be attractive to the visitor. He was of the opinion, however, that the policy of the Americans toward the Japanese was short-sighted as it was on the supply of Japanese labour that the success of the cane-growing industry depended. Out of a total population of approximately 255,000 in all the islands of the territory, 110,000 were Japanese and everywhere he found that the white people of the group had a good word for them. He found that the Japanese were particularly well behaved and in business and as workers they could be depended upon. 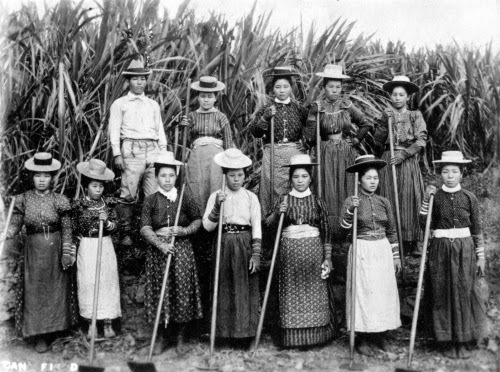 Sugar planters had assured him that the Japanese were most suited to the strenuous work of cane cutting while the Chinese, of whom there were about 13,000 in the country, filled their part equally well in the weeding of the cane fields so essential to the healthy growth of the cane. It was apparent, said Mr. Gray, that the native Hawaiians, although numbering about 20,000, could not be induced to take any considerable part in the development of their country and in view of the fact that the Japanese, after a few years residence in the islands, gravitated to the lighter forms of employment and engaged largely in business, it was necessary that no very serious restriction should be placed on the immigration of Japanese if the agricultural industries on which the life of the group depended were to enjoy continued prosperity. In this connection Mr. Gray mentioned that the area under sugar was already diminishing as there was difficulty in getting suitable labour and the pressure of opinion on the mainland was making the conditions in the islands such that the inflow of Japanese was being restricted. The white population, said Mr. Gray, was something less than 10 per cent, of the entire population, but he found many British people holding prominent positions in the business and professional life of the community. Many Chinese and Japanese were extremely well-to-do, and in their business relations with the white people inspired confidence to a considerable degree. From his own observations and from information gathered while in the group, Mr. Gray was able to say that prohibition was not being enforced to the extent intended by the Eighteenth Amendment, and sly-grog selling was prevalent. Illicit stills there were in plenty, and many of the Chinese and Japanese had become rich since the introduction of prohibition, not only in traffic in liquor but in the importation and distribution of drugs. The future race mixture in the Hawaiian Islands was the subject of some comment by the visitor who mentioned that the remaining 50,000 people comprised Portuguese, negroes and importations from the countries of Central and South America. Inter-marriage was going on steadily and what type would eventually evolve was very hard to say. "Toreadora" is the arresting title of another unusual article in this week's "New Zealand Woman's Weekly." 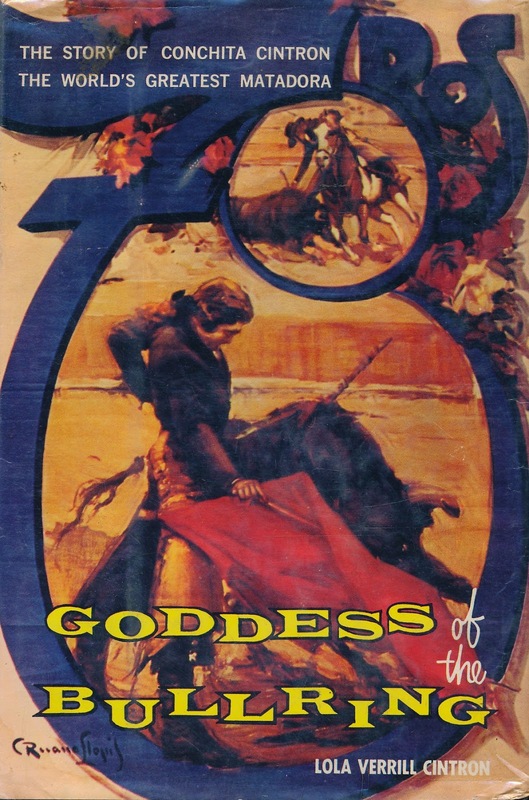 It is the story of the world's only girl bull-fighter, who tells, in her own words, what it feels like to face a furious animal in the ring. Among articles of special New Zealand interest is an interview with a very modest woman, who lives quietly in Wanganui, but is an artist of international fame. How the Girl Guides' Coronation message to the King is being carried throughout the length and breadth of the Dominion before it is presented to the Governor-General for forwarding to His Majesty is the subject of another page of story and picture. And "Spanish Mission" describes another charming modern New Zealand private home. Film fans will find a new William Powell revealed by a contributor, who tells of the women whom he has helped behind the scenes to success. Clark Gable discourses on his ideals of beauty, and helpful hints are given on how to achieve the desired effects. Sauces are the subject of the cooking page, and the knitting pages offer more attractive designs for the colder weather that is coming. "Traps That Lurk in Bathrooms" is another article in practical vein that should be read by every householder, since almost every household nowadays is electrically equipped, and this article deals with the special care that should be used in bathrooms, where dampness is liable to cause accidents that would not occur in ordinary circumstances. Readers have the choice of nine free patterns this week, and also the chance of participating in novel competitions, for which £10 in cash prizes is being given every week. As the well-greased hub is to the wheel so is Hastings to a very great area of sunny Hawke's Bay. There is the nostalgia of prosperity in the very air one breathes and smells, that says very clearly: here is no stagnation, no looking back, no vain regrets, but steady enlivening, exhilarating progress, and bright optimism is subtly manifested on every hand. Take a view from any convenient altitude in the widespread town, and one sees long, white, well-made roads, radiating north, south, east, and west, through the prosperous countryside, disappearing into thin white threads through the green velvety farm lands which are producing some of the most vital munitions of war—viz., mutton butter, cheese—for the feeding of our soldiers and the millions of good British folk depending on them, and wool which helps to make our valiant fighters the best clothed of all the belligerents. That, of course, is the dominant need of the present critical time in the history of the Empire, but before the dread ogre War showed its head, the products from the district, ever increasing as larger areas are thrown into cultivation, played an important role in bringing prosperity to New Zealand. Millions of pounds sterling have been garnered from the Hawke's Bay downs, and the circulation of such money far and wide must have had a farther reaching effect on the progress of the Dominion than may at a superficial thought be conceded. In the centre of this veritable garden is Hastings, the bright, busy, bustling, wide-awake town through which streams "the flood of many waters," leaving at least a proportion of its golden sediment in the hands of the business men, shopkeepers, and tradespeople of the town and district. There is perhaps only one "fly in the amber" in this district, and that is the fact that the progress of settlement, satisfactory as it may be considered as far as Hastings itself is concerned, is retarded by the land being held in such large blocks. There has been a utile cutting up in some parts, but there remains the unalterable fact that there are farms of between 50,000 and 80,000 acres in the district, sacred to sheep that could be brought into profit by closer settlement, land of a quality that would support the population of the district a hundred times over. In the meantime King Wool is the popular god of the district, and while the war is on must be a very affable monarch indeed to have dealings with. The time may come when many broad acres will be comfortably dotted with smiling homes, but that time is not yet. At present as far as the eye can reach the fair domain is dotted, but the dots are sheep graduating toward the shearing-shed and meat works. 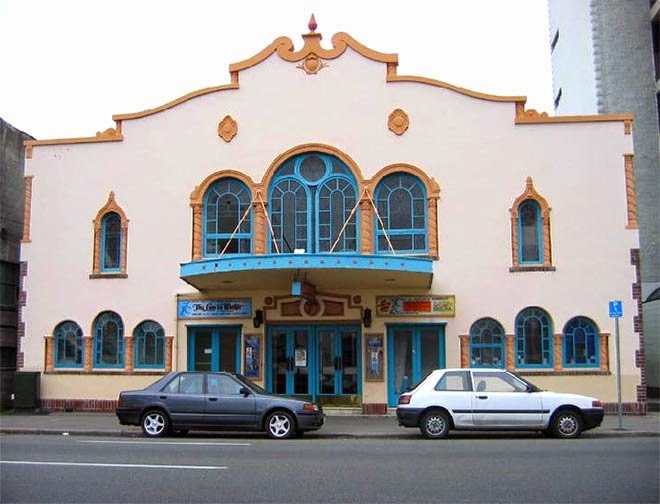 Hastings can claim one of the finest municipal theatres in New Zealand. It was erected in 1915-16, and opened in October, 1916, since when it has been in constant use. The council was fortunate in securing the services as architect of Mr. Henry E. White, of Sydney, Wellington, and Auckland, and the result is a theatre that would command attention in any city in the world. It is the first theatre to be designed externally in the Spanish mission style, a smooth, chrome-coloured finish, broken here and there with characteristic windows (each of which holds a box of scarlet geraniums), and overtopped by far-projecting eaves, that are, with the rest of the roof, heavily tiled with red Spanish tiles. The design is at once simple, yet striking, and is nicely in accord with the sunny climate of the place. The interior is as chaste and simple in design as it is efficient for every theatrical purpose. The lines of vision are perfect, the acoustics excellent, the seats comfortable, and the stage is large enough to accommodate the most elaborate productions. There are eight boxes, and seating accommodation for 3400 people. The Municipal Theatre only cost between £15,000 and £16,000, and is the cheapest and best in Australasia. Between lettings to touring companies, the council runs its own picture shows, always reserving Saturday evening as its own special perquisite. Although the acuteness in the shortage of houses is somewhat less now than it was year or two ago, the urgency of the housing question is still a matter for the serious attention of both Government and municipal authorities, and shows no real disposition to quit troubling. In fact, the failure which has in reality attended the State scheme for solving the housing problem leaves the door wide open for suggestions promising a solution which is sound financially and practicable in form. Under such circumstances the opinions of an architect who has had experience in an official capacity with the State housing scheme in England and in the erecting of cottages under the Irish Labourers' Cottage Act should be interesting. Mr. John Mitchell, who was formerly of the firm of Mitchell and Watt, for many years architects to the Auckland Education Board, recently returned to the Dominion after being absent for eleven years in Great Britain, and since his return he has been taking observations and making inquiries into the question of housing. In the course of an interview on the subject this morning, Mr. Mitchell remarked surprise and pleasure at the splendid evidences of the progress that Auckland has made in the past eleven years. The notable improvement in the roading of the city., the replacement of old by new buildings in the main streets, and the introduction of the Canadian and Californian bungalow style of domestic architecture, were matters upon which he made special comment. “ After being away from Auckland for so long I appreciate more than ever the natural beauties that endow Auckland City," he said. "The people of Auckland should be very proud.of their habitation and correspondingly jealous of it—doing nothing to mar these beautiful natural features, and leaving nothing undone to enhance them." ARTISTIC LAYING OUT OF BUILDING SITES. Coming io the scientific, artistic, and economic laying out of building sites, and the areas considered "sufficient when intensively cultivated," Mr. Mitchell remarks that it is interesting to note the trend of building operations and the corresponding values of land for dwelling sites. Takapuna. for instance, recently required 1/4 acre as a minimum, Otahuhu requires 1/6 acre, while Mount Albert is satisfied with 1/8 acre. The English Housing Act makes provision for 1-1/2 acre "as being so much better than that which formerly prevailed." "So far as Auckland -City is concerned," he said, I should be failing in my duty if I did not point out the dire need for great improvement in the housing conditions, in the backyards, and in the approaches to the houses in many parts of the city proper—not very many thousand yards from the Town Hall itself, in fact. Such conditions are common to all cities, old and new, but modern health ideals make the abolition of such conditions imperative. The matter is one requiring wisdom, vision, patience, and a spirit of sacrifice. It is, to a considerable extent, a real workers' question, as affecting artisans' dwellings x convenient to the artisans' work. "When I asked questions on the state of neglect, one property owner vigorously disclaimed responsibility, owing to the utter disregard of care and interest on the part of the tenants, and their defiant attitude. Tenants on the other hand exclaim ‘How on earth can we be expected to keep such places decent, clean, and tidy?' That is one aspect of the housing question, and not only so, with one most intimately affecting the I health of this great city." "Another matter that caused me surprise and disappointment on my return is the number of houses erected and still being erected in wool, particularly in view of the need for conserving every stick of timber in the country for proper timber purposes. I cannot help asking if the people of New Zealand properly understand or appreciate the full measure of loss and the actual calamity that they are allowing to overtake them by the wrongful use, the waste, and the exportation of any kind of timber from this, their country. There is an unreasoned prejudice in the minds of some against the use of concrete, due partly through lack of knowledge and partly to obstructionist ideas which discourage enterprise and the bringing forward of samples of modern aesthetic concrete construction. And then again, the timber of the new buildings is very different from that in most of the older kauri built dwellings. I wonder what will be the state of some, at any rate, of the modern Californian and Canadian bungalows upon which so much money has been lavished, in a few years' time. They are very pretty and are calculated to satisfy a natural craving for the ornate, but with the use of so much inferior timber—even pinus insignis has been freely substituted in framing—what will be the result, say, in twenty years' time. Wooden house blocks will hardly last that time, and the main fabric of these structures will give serious trouble within 25 years." The economic wisdom displayed in roofing material was also questioned by Mr Mitchell, who remarked that charmingly as the red roofs of Auckland fitted in with their surroundings, mere red oxide would not long conceal damaged or defective galvanizing. Slates, tiles of burned clay, or cement and sand would have been far preferable, and the difference in cost could have been well saved out of labour and materials spent on questionable exterior embellishments. Coming to his experience of the English State Housing scheme, Mr. Mitchell remarked: "It was a splendid conception as a part endeavour to make England's land fit for heroes to live in," but so far it has not done so. The scheme contemplated the spending of some -500,000,000 on housing, and a vast organisation was built up to carry it out - committees, scientists, engineers, architects, experts, inspectors, commissioners, clerical staffs, etc., galore. Much useful and valuable work has been done in investigating old conditions and formulating basic principles upon which to determine future action and avoid the congestion and follies of the past. The money was to be found by the Government and held available for the municipal authorities to spend, subject to a maximum contribution of a penny in the pound on the rates. Suggestive plans and specifications were issued, special forms of construction were investigated supplies of building material and appliances were controlled and held available. Commissioners and their armies of officials were appointed for the various regions into which the country was mapped out, city engineers and surveyors were entrusted with extended functions, architects were sometimes fully employed, and other instances coldly and ungraciously ignored in favour of the bureaucratic method of procedure. These vast proposals naturally led to a correspondingly vast preparation by vested interests in land, building materials, and requirements of every description for cornering purposes. The builders and employers affected formed a close federation for joint action and mutual benefit, and then in the nature of things every form of labour took action to conserve its interests. Strikes, disputes, emulations, and wranglings led to widespread delays, obstruction, and waste. Altruistic cooperation did not manifest itself in action. The Premier of England, well nigh exhausted physically and mentally by war service and international adjustments, could not give any attention to mere domestic concerns, but he saw the state and drift of things, and wisely cried 'Halt!' And that is the position to-day, and rightly so in view of how matters were going." CA' CANNY TILL TIME SERVES. Blame is certainly not confined to labour, as some would have us believe. But Labour problems are made to loom so big now in the affairs of nations that the immediate reactions upon industrial endeavour are most serious. Before any relief can be given, trusts, cornerings, profiteering in land and all raw materials, must be made impossible by moral conviction, followed by legal enactment. It would appear that wages must drop or a much larger volume of work performed for present wages before the economic problem can be even approached for solution. Mr. Mitchell explained that his official duties carried him into close touch with the effects of the various influences of destruction and construction, and he was able to see where New Zealand could gain some useful lessons from the Mother Land in how not to do things. "My experience convinced me," he said, "that until such time as the nation fits itself by earnest study and endeavour, to carry out scientifically so relatively simple a matter as housing, the Government must ca' canny and individuals get a more on." Our Spanish Mission Furniture Will give you a room showing a decided atmosphere of refinement, being a genuine revival in historic memory of the sturdy middle ages. 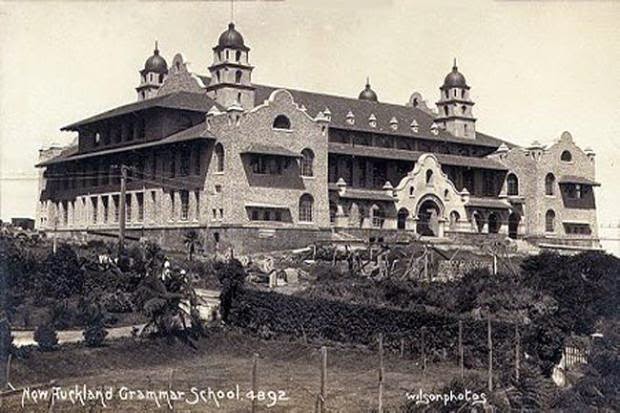 The beginning of the 1916 school year for the Auckland Boys' Grammar School will always be associated with the crossing over from the old site in Lower Symonds Street to the commanding site on the slopes of Mount -Eden. At last the scholastic institution which is part of the civic life of Auckland has found a home worthy of the great reputation it has earned. By to-morrow the new building will have had its first testing as a place where teachers and pupils together grapple with the humanities and the sciences. The "new boys" were in attendance yesterday, and to-morrow a start will be made by the full school. The handsome red-roofed pile of masonry which constitutes the new Grammar School is now one of the architectural features of the city. A more picturesque locality for so fine a building could hardly have been obtained within easy reach of the city. In many respects Mountain Road is more like a wooded country lane than a suburban thoroughfare. Then, too, there is the bold background of Mount Eden, and a superb view, which embraces the northern suburbs, Rangitoto and the wide expanse of the gulf. Wonders have been worked with the grounds. A year or two ago the place where the school now stands was a bed of volcanic rocks, flanking the "old rifle range." These were patiently removed to allow of top-dressing, and now the school has the benefit of a sports ground, as level as a billiard table, and as soft as a residential lawn. 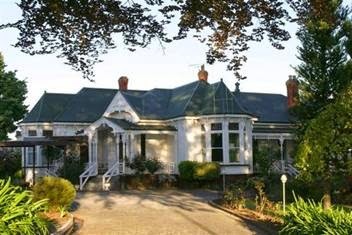 Added to all these advantages is the fact that the school is within easy walking distance of the penny section at the top of Symonds Street, and the stop in Khyber Pass, near the Park Road junction. The new building was designed by Messrs. Arnold and Abbott, architects, and the work was carried out by the firm of Messrs. U. K. Hutchison and Co. Its cost was l36,000. The architects have adopted the "mission" style of building, an attractive form of architecture which is associated with the early religious institutions founded by the Spanish missionaries in Southern California. The style was chosen for the Auckland school as being peculiarly suitable to this climate. To mention only one feature, an exceedingly important one in a scholastic institution designed to accommodate several hundred boys, the window area is carefully gauged to give the best lighting results in our climate. The building consists of three storeys and a basement, built in glazed brick, with rough-cast wails, the roof being covered with Marseilles tiles. The floors are specially deadened, so that the complete silence which makes for isolation and effective teaching is ensured. Two large flat roofs, both at the back and at the front on the first floor, provide open-air spaces that may usefully be employed in the administration of the school curriculum. Over these flat roofs light is admitted into the large central hall, which is, perhaps, the most significant feature of the whole building. THE HEART OF THE BUILDING. 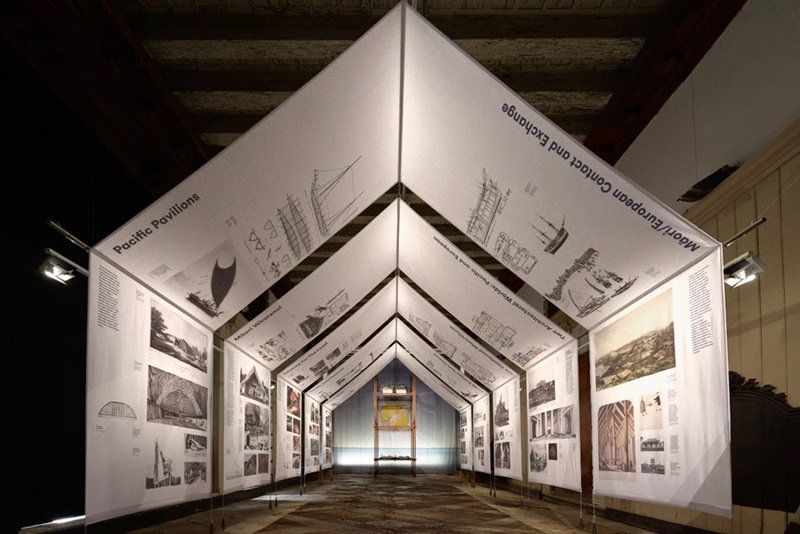 This interior central hall, which is 108ft long by 48ft wide, and has a total height of 30ft, is faced with glazed bricks in greys, browns, and greens, to the springing of the barrel vault, at a height of 25ft. The barrel vault is finished partially in plaster and partially in cement sheets. The light comes through piercings in the vault looking out over the flat roofs already referred to. Corridors and the first-floor gallery run round three sides of the central hall, and there is also a gallery on the second floor, at the west end. All the rooms open on to the galleries or the corridors. From the outside, the outstanding feature of the building (apart from the imposing entrance on the north-east, consisting of an open arcade running between two pavilions, with an accentuated central feature) is the effect of the towers at the four corners of the central hall. These are carried up as special features, and are typical of the style. They are used for the reception of emergency water storage tanks, each carrying 1,000 gallons, and at the top storey of each tower is a large ventilator, each one effective over a quarter of the school. The ground floor is level with the playing fields and below this level, on the north-west side, are workshops and shelter sheds. The ground floor and first floor are occupied by class-rooms and lavatories, and the second storey, which is carried up only at the end of the hall, is used to accommodate on the one end the library and museum and on the other store room and lavatory. In the basement there is a bicycle room and a janitor's room. Light class-rooms in perfect shape. The seven essential requirements of a school building have, it is claimed, been obtained by adopting the central hall type of construction. The corridors are ten feet wide in every case. The headmaster's room is so placed as to give adequate supervision over the front entrances and the corridors. A separate staircase gives quick access to the gallery round the hall. The back of the building is well under the supervision of the masters from their common room, which also overlooks the playing fields. For cleaning purposes provision has been made for the janitor on each floor, sinks, cupboards, and shoots being established at three of the corners. It will be seen, therefore, that the building is not only distinctive and impressive from an architectural point of view, but from the point of view of practical workaday use by six hundred boys and their masters it is a comfortable, healthy home, where the body may develop equally soundly with the mind. Undoubtedly the greatest building work now in progress in Auckland is that of the construction of the new Grammar School, at a cost of about £32,000, on the northern -slope of Mount Eden. The building was designed by Messrs. Arnold and Abbott, architects, of Auckland, and the work of erection is in the hands of Mr. V. E. Hutchison. Since the commencement of the work about twelve months ago, in spite of the strike of the workmen on the building and the outbreak of war, very satisfactory progress has been made, and the principal part of the work, that of the main structure of the building, has now been accomplished. The detailing on the face of the building has already been commenced, and even now, viewed from Khyber Pass, the college presents quite a handsome appearance. It is expected, so far as the contractors are concerned, that at the present rate of progress the building will be completed by next Christmas. 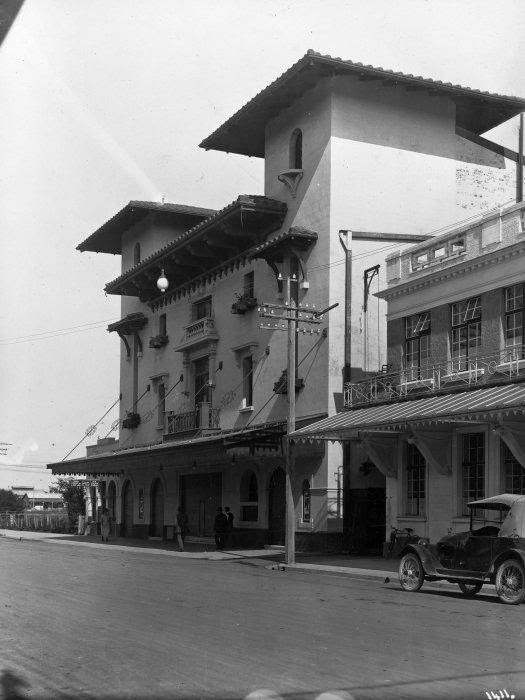 The new school is designed in the mission style of architecture, that which is being chiefly employed in the construction of the various buildings in connection with the Panama Exposition. The entire face of the outside walls is being "rough-casted'' in the American style, which should have a very pleasing effect. All the gables will be formed with wide sweeping curves, typical of this style of architecture. The roof will be covered with red tiles, but this work has been unfortunately delayed by the war. Thousands of tiles are ordered, but, pending their arrival, work in this direction is practically at a standstill. The main entrance to the building will be approached by a flight of broad steps, while similar flights on either side will also lead up to the long balcony. The corridors beyond the vestibule are broad and lofty and surround the assembly hall, which measures. 108ft by 48ft, and occupies the central portion of the building. Opening off the corridors are the class-rooms (28 in all), laboratories and private rooms for the convenience of the masters, while on the ground floor there are the workshops, bicycle room and shelter shed. The three storeys will be connected at each corner of the building by staircases from floor to floor. The headmaster will also have the use of a staircase from his suite of rooms in the front of the college to the floors above and below. Stationery rooms, store rooms, etc. will be found on the lower floor at the rear of the building, while on the third floor a large room will be set apart as a museum. At the rear of the building two large doors will give access to the playground, on which, when the main building is completed, a cricket ground, a football ground and tennis courts will be laid out. The construction of the swimming bath and the erection of the various outbuildings will be proceeded with after the more urgent works are completed. When finished, the new Grammar School will be one of the largest and most up-to-date in Australasia, and will be a building of which the students may well feel proud. 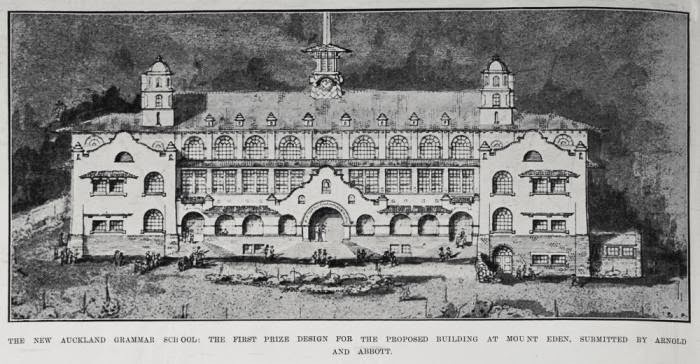 The fact that the Auckland architects came first and third in the competitive designs for the new Auckland Grammar School to be erected at Mt. Eden, proves the wisdom of the Board of Governors in having selected two judges outside of this district. The gentlemen were Mr. P. Y. Wales, of Wellington, who is president of the New Zealand Institute of Architects, and Mr William Creighton, a well-known Dunedin architect. These gentlemen met the members of tbe Board of Governors yesterday afternoon at the Choral Hall, where all the designs were displayed. The following were present: Sir G. M. O'Rorke (chairman). Professor Brown, Professor Thomas, Messrs A. Kidd, 0. J. Garland, A. R. Harris, and the headmaster, Mr J. W. Tibbs. The judges had to inspect very varied types of buildings, some being severely plain, while others were almost Eastern in the ornate decorative work. The prizes will be allotted when it is found that it will be possible to erect the buildings as designed for the sum stipulated, namely £40,000. The first prize is £400, second prize £200. and third prize £100. The design which received first position has the advantage of being tastefully artistic, and eminently suited to sub-tropical climate like that of Auckland. Messrs Arnold and Abbott have adopted what is known as the Mission style as understood in Southern California. The reason for this is that thie climate here is similar to that of California, where a semi-open-air life in vogue[sic]. This had a good deal to do with influencing the design, but another consideration that undoubtedly weighed was the large amount of window area required to obtain the necessary ratio of light to the floor space. The design lends itself to standardisation of windows, a very important consideration from an economical point of view. The exterior of the building from the ground line to the ground floor is to be of red brick, and the rest of rough cast white on bricks, with red tiled roofs. The floors and staircases are to be of ferro-concrete— also, the flats. It is proposed that the entrance vestibule, headmaster's suite, and ladies' room shall be covered with rubber tiles, and all others with wood blocks, which are less noisy and easily kept clean. At each end of the building is to be a tower, which will be utilised as a ventilator. The designers have taken advantage of the formation of the site for the school. On the Mt. Eden side the ground is 12 feet higher than on the western one, nearer the quarries. The main land of the playing field has therefore been adopted, and the building is to face the north-east, running parallel with Mountain Road. The main floor will thus be on the same level as the playing field, and this enables shelter sheds to be constructed underneath on the western side. Advantage has been taken of the call for a swimming bath to introduce a very fine feature between the schoolhouse and the gymnasium block. The gymnasium, armoury, etc. are grouped around the swimming bath, the walls of which will form a convenient shelter from all winds. The architects have attended carefully to the artistic effect, as well as utility, and the design provides for a cluster of palm trees in the small gardens, so effectively employed in the streets of Sydney, Melbourne, Los Angeles, and the Mission towns of California. The central hall type has been adopted, with a corridor running all round. The east wall is to be left blank for a certain portion of its length to provide room for honours boards and shields. The plans also provide for a separate boardinghouse block to harmonise with the main design. All the buildings are well aspected and favourably arranged to give access to the playing fields. The cost of the school block, including workshops, is estimated at £30.000; conveniences, bath, latrines and janitor's quarters £5.000; and boardinghouse, £5,000; making a total of £40.000. "Woodenhead" writes to the Manawatu Daily Times: "Sir, In your article on the question of architecture in New Zealand arising out of some remarks made by the Governor, you have hit the nail on the head in stating that the people who build are at fault in going to the Builders instead of an architect for a plan. The result is poorly designed and badly built houses. I built a house some time back, and was foolish enough to go to a builder, with the result that I regret it very much now. My house after one summer is falling to pieces. I find that the builder has no ideas beyond the ordinary cottage, also that his plan and specification is not binding on him, and he can do as he likes. I certainly saved the architect's fees, but my house was ruined for ever, and what I have been saving up for years for resulted in disappointment."